On Friday morning I asked Coreontae DeBerry to draw an outline of his hand on a piece of paper. 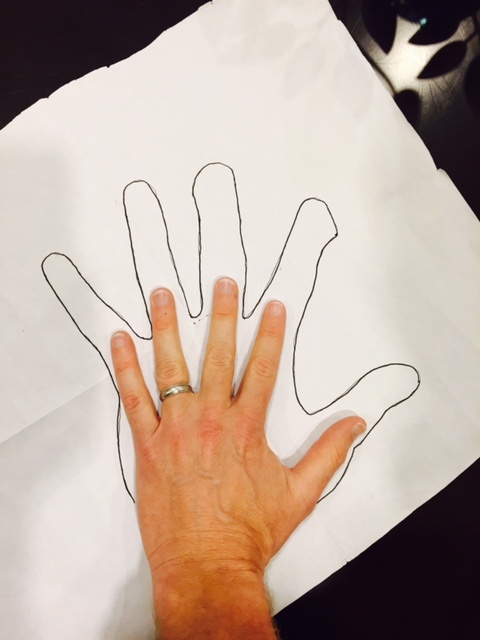 Here’s a photo of my normal-sized hand in front of Cory’s outline. “He has the biggest hands in the world,” said Farad Cobb. Fittingly, the man with mammoth mitts earned a big hand from Bearcats fans in Thursday’s 66-65 overtime win over Purdue. 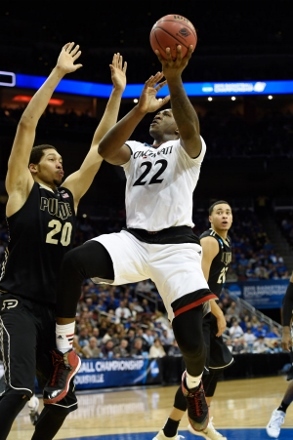 When Octavius Ellis was ejected early in the second half for committing a flagrant foul, Cincinnati needed DeBerry to stay on the floor for the rest of the game to defend Purdue’s 7-footers A.J. Hammons and Isaac Haas. The 6’9”, 275 pound junior played all but 50 seconds of the final 21:22 (including overtime). “After we told Octavius, ‘Don’t worry about (getting ejected),’ we turned to Cory and said, ‘Time to step up. We need some big minutes from you and you’re ready for it,’” said Cobb. DeBerry played a season-high 26 minutes which was five more minutes than his previous three games combined. “I was really, really tired but I knew that my team needed me the most when Octavius got thrown out of the game,” said DeBerry. “I told him that he could worry about being tired after the game,” said Shaq Thomas. DeBerry didn’t only protect the paint on defense. He scored a career-high 13 points including a balletic reverse layup with 3:08 left in overtime that gave Cincinnati the lead for good. DeBerry’s performance was undoubtedly a shock for Purdue, but Cincinnati’s players and coaches claim that they weren’t surprised. “I knew he had it in him,” said Cronin. “It’s our job to get it out of him. That’s what they pay us for. With all due respect to my buddy Doug Kecman who is out there coaching the Seven Hills girls’ team, he’s an amateur and we’re professionals. We’re well-paid and we have to get it out of him. On Saturday, DeBerry, Ellis, and Gary Clark will have to contend with the biggest team in college basketball. Kentucky has three starters that are 6’10” or taller and brings a 7-footer off of the bench. Coreontae has rarely been accused of not giving a full effort. In fact, in middle school when he couldn’t find a baseball mitt to fit his already-giant hand, he volunteered to play the outfield without a glove.